Dance of the Light. James Ashers’ follow-up album to his number 1 hit album Feet in the Soil, leads you on a romantic journey. A tender collection of music bringing renewed nourishment and healing to the body, mind and spirit. Customer Review – “This CD will help peace reign in your heart. Its wonderful combination of soft music and nature sounds calms even the most stressed person after a long hard day.“. An ocean of light, sometimes passionate, sometimes calm, softly enveloping, sometimes playfully enticing – that is music of James Asher. 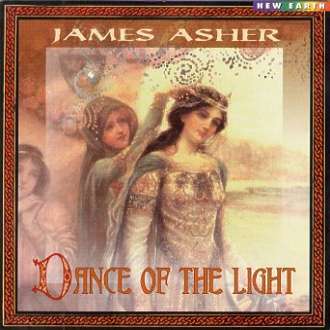 His album Dance of the Light is a meditation, a permission for existence to pass through you and to clear you. Music of James Asher is so beautiful, so harmonious! Being weaved from many thinnest laces, it is very emotional. Electronic music of James Asher is simple and simultaneously deep. It is very light, almost weightless, and romantic. It is refined and subtle. And the birds singing early before morning just intensify emotionality of James Asher’s music. Listening to Dance of the Light, more than an hour passes immediately, as if it was one minute. And one wants to listen this music again and again, because it brings tremendous delight, because it has healing power of Light, healing power… of Love itself. Serge Kozlovsky. Reproduced with permission from Serge Kozlovsky’s New Age web site. A compilation of instruments all sharing a warm, relaxed and meditative quality. The mood is serene and calm, and the music enjoys a well-crafted sense of space and peace. A must for those looking for music to help them move into a gentle, positive and tranquil realm of experience. The listener will greatly benefit from the exquisitely chosen sound sources. Reproduced with permission from the New Earth Records web site. The music of a silent forest at down. The music of those daybreak hours when secret wishes and inmost thoughts become awaken and one may look into the deepest nooks of consciousness. First passionate, then quiet, gently covering, then playful and alluring ocean of light – all of it is James Asher’s music. His Dance of the Light is an album-meditation, it is a leave to the existence to pass through you and make you clear. The music of the compositor is so beautiful, so harmonious! Being weft from a finest lace it is very emotional. The electronic music of the Dance of the Light album is simple and sophisticated at the same time. It is very light, practically weightless and romantic. It is refined and exquisite. And the sounds of birds at early daybreak do nothing but intensify the emotionality of James Asher’s music. Being next to the bestseller Feet in the Soil the Dance of the Light album has revealed one more distinction of James Asher’s talent who is a beautiful melody maker, a master of salutary, relaxation music. An acquaintance with this aspect of his creative work would be insufficient without his album Rivers of Life produced by Spring Hill Music Studio in common with the Dance of the Light album. A meditative, smooth and streamy tune of Rivers of Life strengthens the state of inward peace and quiet. While listening to this divine music two hours and more fly away like a shot, as if they were a minute. And you are eager to listen to this music time and again because it gives immense pleasure, since this music has a salutary power of light, a salutary power of Love itself without which Life cannot exist. Credits : Composed, recorded and produced by James Asher. Executive producer: Mike Booth. Recorded at Starfield Studios, London, during 1993/94. ‘Dawn at Dev Aura’ recorded at Dev Aura, June 8th, 1993. Dedicated to Vicky Wall, with love. All music published by James Asher/Three Kettles Music (ASCAP/PRS). New Earth Records [NE9513] 1995.